Today I will tell you a story about the little town where I live in the beautiful province of Quebec in Canada. I used to live in one of the biggest cities in the world a few years ago, Mexico City, and I moved to live with my husband in a little town in the country in Canada, where life can be so different from the life of a big city. This little town is sourounded everywhere by beautiful landscape, anywhere where you look at, all you can see is the country with small houses and farms here and there, life is so quiet here and it’s also good and nice. Most of the people live on a farm, whether they are farmers or not, some of them have a different kind of job today, but it wasn’t like that always, before most of the people used to have a job related to farming. When I think about living on a farm, I used to think about all kind of jobs anyone needs to do to have a good life there, from taking care of animals to do different chores to make the farm house a cozy home, and in this category you can think about all kind of jobs to make from healthy and yummy cooking to knit and sew clothing for the family. And I can’t miss thinking about making quilts to keep the family warm while sleeping during the long and cold nights during the hard wintry weather. 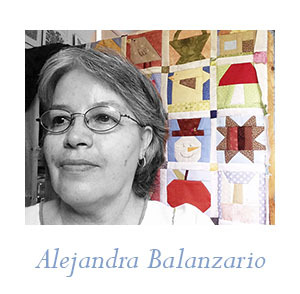 I live in an area where women have been making quilts year after year for many years. In this little Canadian town, every year there’s a Fair well known by almost everyone in Canada, it’s the mayor event of the year! When you think about how many things a farmer needs to do to make any house a home and provide its family with the best, you only need to visit this expo and you’ll see a good example of everything you need to do to provide your family with the best. From a wooden chair, to the most beautiful flower arrangement, to a home baked cake, cookies and muffins, to warm clothing to keep everyone warm during the winter. 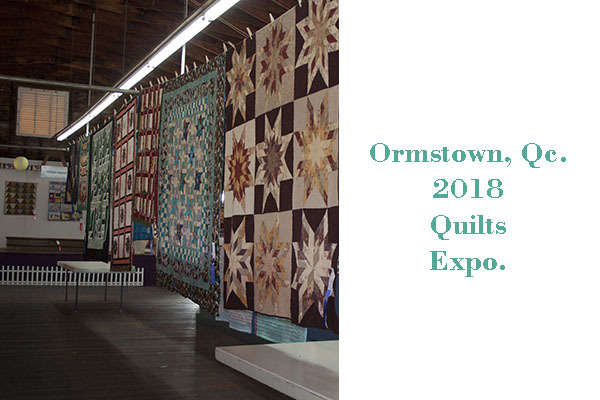 From 104 years ago, it’s the time for all quilters in the area to show their creations, and it’s something you shouldn’t miss if you live in the area. If you’re planning to visit Montreal some time, you might consider visiting it during this time so you can visit Ormstown Fair. Since I move to Canada, I have been part of this expo, I used to bring some of my quilts every year, I only missed last year, and this year, I’m lucky to be here and to be part of it. Let’s take a visit to the Ormstown Fair 2018. Weather has been nice the last couple of days, it was perfect weather to visit the fair this morning, a view to the fair with the industrial building in front where the Quits expo is held. A small “sugar Shack” to show everyone how the maple syrup is made, yum! A view to the fair, children love to come here every year! Time to show the best of the best from the farm, the judge is taking his time to check on each one of the young cows. Let’s go the Industrial Building and take a look to my quilts!! There was a few beautiful quilts displayed on this expo, a great job from all the quilters than came to share their work here. A few more quilts, most of them were quilted by machine, but I must say each one of them had a beautiful quilted work! This time I made a video to share it with you, it’s in Spanish, but you can walk beside me and take a look to this expo and take a look to more things, all of them a great art work!! I thank you for making the time to stop and read my blog, if you have any question, leave a comment and I will reply to you.